The Holocaust is one of the most well-documented and studied cases of mass murder and genocide ever to occur. The horrors of the Holocaust are taught in schools, universities and there are museums all over the world dedicated to the memory of all the victims whose lives were tragically cut short. There have been a number of films and television programs that also tells various stories as well, but one movie stands out above the rest and that is Schindler’s List. Steven Spielberg’s crowning achievement in telling the story of Oskar Schindler and how he saved the lives of over 1,200 Jews is a powerful story and is truly unforgettable. Being twenty-five years old, the film stills packs quite an emotional punch. So, how does it stand after all this time? What was the initial reaction when the film was released? Is this story still relevant today and if so, why? The Holocaust is a historical event that schools teach every year as it’s a moment in history that should not be forgotten or passively talked about. The brutality, the fear and the lasting devastation that resulted from these War Crimes is something to not take lightly. It’s not something to poke fun at, mock or think is unimportant. Real people were affected by this, families were destroyed and nearly an entire religious class of people was almost wiped off the face of the Earth. But there are good people who can stop this madness and one of them was Oskar Schindler. A German Industrialist who sought to profit for himself during World War II and ended up becoming an unlikely hero to the Jewish community for his actions. A book was written for which this movie is based on. Schindler’s Ark was released in 1982 at the insistence of Holocaust survivor and one of Schindler’s Jews, Poldek Pfefferberg. The book uses real names but fills in the gaps of unknowns with fictional events, dialogue and scenes created by the author Thomas Keneally. The book went on to be a success and was later adapted into what is now known as Schindler’s List. Spielberg, a Jewish man who lost family members during the Holocaust, was unsure if he could handle making a film about the Holocaust. He was thirty-seven years old when he heard about Schindler’s story and wanted to make the movie, but felt he wasn’t mature enough to do it right. He waited ten years. Other directors were considered such as Martin Scorsese, Sydney Pollack, Billy Wilder (who lost family members during the Holocaust) and Roman Polanski whose mother was killed at Auschwitz and even lived and survived in the Krakow ghetto. It wasn’t until the Berlin Wall fell and the media attention of Holocaust deniers was becoming popular when Spielberg finally decided that he would make the film. The main cast included largely unknown actors at the time. Liam Neeson and Ralph Fiennes were not big movie stars, something that Spielberg didn’t want to overshadow the film. The only exception was Ben Kingsley for his Oscar performance in Gandhi. For instance, Mel Gibson, Harrison Ford and Kevin Costner were looked at to portray Schindler but Spielberg felt that their screen presence wouldn’t work to tell the story in the way that it needed to be told. Besides the main cast, the film also includes Israeli, Polish and German actors and every one of them plays their character with exact realism. All the acting in the film is excellent but the Jews, the SS Officers and the German soldiers are equally matched as well. One thing that I’ve noticed over the years are people’s opinions about the film. Almost everyone I’ve talk to always mentions the on-screen violence. They are shocked, horrified and can’t believe what they are seeing on the screen. Granted the violence is hard to watch but why is that? I believe that violence can be presented differently depending on how you approach it. Why is it when we watch a cop movie we are entertained? What about all the superhero films that feature cities destroyed with countless people killed during the battle and yet no one cries about it? The focus is the action and not the consequences of what is happening. First off, much of the violence in Schindler’s List is an accurate account of what really happened. Soldiers walking up to Jews and shooting them in the head, beating them, berating them and instilling fear. The liquidation of the ghetto is one scene in particular that gave me the same emotions as when I watched the Omaha Beach landing in Saving Private Ryan for the first time, we are there. Another thing that makes Schindler’s List work so well is the information that we already know prior to seeing the movie. The young, sick and old were generally sent to the death camps while the workers worked until they proved to be not of value. Take for instance the scene where the children are hauled away in trucks and the mothers see their babies leaving. The parents know full well what is going to happen to them as do we. It’s a devastating and heartbreaking realization and Spielberg doesn’t hold anything back. He shows us everything and sometimes it’s not pretty. It’s the grim reality. A common theme that Spielberg is known for is his way to use emotion in his movies. At one point we laugh and then we get scared (the chum bucket scene from Jaws), but here Spielberg shows restraint and allows the audiences to determine their feelings. Much of the film doesn’t paint the image with sad, melancholy music and instead relies on the actors to do their work and let the scene unfold. It’s powerful to say the least. Speaking of emotion, I cried on nearly a dozen occasions while watching the film in theaters, at one point I had to excuse myself and take a two-minute break to pull myself together before returning. I’ve seen the movie before several times, but watching it in theaters is like watching it for the first time. This is probably one of the most powerful experiences I’ve ever endured in the theater. The newly restored 4K presentation makes the film look amazing and the sounds of the typewriter and train whistle are forever burned into my mind. The movie also looks timeless, it hasn’t aged a day and that’s all due to cinematographer Janusz Kaminski. His work has allowed the movie to appear brand new, and even feels like a classic piece of cinema similar to Gone with the Wind and Casablanca. The black and white presentation also makes the film look as though we aren’t sure when it was made, thus making it timeless. As much as people say that Schindler’s List is a sad movie, personally I believe it’s an inspiring film. Yes, the movie is sad, but its powerful in the character of Schindler. He wanted to make money and ended up doing something extraordinary, the very reason people remember him today. In the face of evil when horror surrounds us, it’s comforting to know that light can always shine somewhere, and that come from the list that saved so many people from certain death. I love this movie as it feels real in the sense that I felt I was there. At some points it didn’t feel as if I were watching a film. I could talk about Schindler’s List for hours as it’s One of the Best Films Ever Made in my opinion. Being twenty-five years old, the movie still hits home especially with all the media reports of hate crimes still happening all over the world. I’ll never understand why people choose to hate instead of embrace but one thing is certain. We can’t allow the hate to take over the good in the world. We need more people like Oskar Schindler and in some ways there are. Schindler’s List is the crowning achievement in Spielberg’s filmography. No film brings out the emotions quite like this one and we thank Spielberg for bringing Schindler’s story to life. In fact, his story was talked about being made into a movie ever since the 1960s and I say this with complete honesty, no one could’ve done a better job than Steven Spielberg. This movie captivates you, terrifies you and is something you’ll never forget. 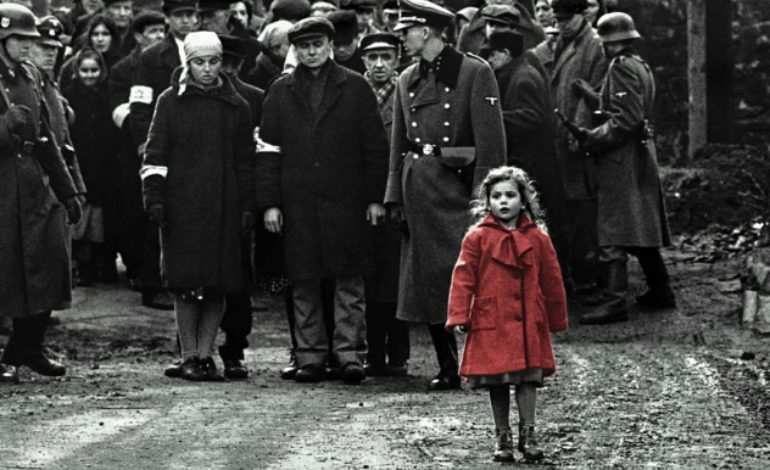 With the iconic theme by John Williams along with the one of the powerful endings in film history, Schindler’s List is still one of the most important films to watch. It’s not a film about the Holocaust, it’s about how 1,200 were saved and given a chance to live life free from persecution and hate. It’s an experience you’ll never forget.